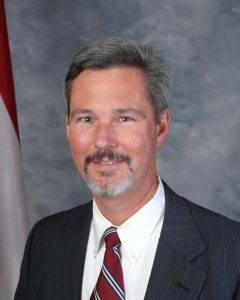 Michael O’Quinn, who has served as Butts County Attorney for over 20 total years, will step down from his post effective April 1, 2019 to accept a new position with the Association of County Commissioners of Georgia, also referred to as ACCG. First appointed in 1996 following a string of attorney appointments, O’Quinn brought with him a considerable level of expertise in the area of county government law, a very specific practice area which he and a handful of other attorneys have helped to shape and define over the past two decades into one that is recognized by many today as a specialty. Even during a two year period when he was not the County Attorney, he continued to consult with the County on a number of legal issues, guiding the County safely through the sometimes-murky waters of the law as it relates to local governance. “Mike O’Quinn is a great asset to the county and will leave big shoes to fill” remarked County Commission Chairman Ken Rivers on January 30th. “Government law is a specialty practice and Mike is one of the best in his field”. County Administrator Steve Layson echoed this, adding that “Mike is a consummate professional and a valued advisor to our County”. More than a few of his policies written for Butts County have been adopted by counties all over Georgia, such as his written policy on a Code of Conduct for County Commissioners, which Butts County reauthorizes each time a new Commissioner joins the board. He has also successfully defended or assisted in the defending of Butts County in any number of legal issues that counties often face, with a superior rate of success. He particularly excels in drafting County Ordinances, which are local laws passed by the Board of Commissioners, as well as having a deep knowledge of personnel law, employment law and service delivery strategy. His advice and knowledge has always been timely and welcomed by those he has served with, including twenty elected Commissioners, seven County Administrators, six County Clerks, seven Constitutional Officers and numerous Department Heads. “I just can’t imagine Butts County without Mike O’Quinn as our Attorney” said Deputy County Administrator & County Clerk Michael Brewer. “I have worked with him for such a long time that it’s hard to remember Butts County before he got here. He has always brought a pragmatic, methodical approach to legal issues, ensuring that we operate within the often-changing strictures of the law. While I have always appreciated him as our legal council though, I value his friendship far more”. O’Quinn won’t be completely gone from Butts County though, because his new job with ACCG will involve working with counties all over this part of the state, serving as a liaison between the Association and the county governments that it serves and represents. ACCG’s main mission is to support local government, educate county officials and advocate at the legislative level for hundreds of Georgia’s County Commissioners, Managers, Administrators, Clerks and County Attorneys, helping to ensure that county governments and its citizens are not unduly burdened by new state laws, unfunded mandates and regulations that could impact service delivery. “Mike O’Quinn has truly been a blessing to Butts County and we offer our blessings to him as he takes up his new job with ACCG” said Commissioner Robert Henderson, who has worked with O’Quinn longer than any of his colleagues on the board. “I know that whatever he does and wherever he goes, our thanks and our hopes for his future will go with him”. The County is currently soliciting proposals for a replacement County attorney, seeking one who has appreciable experience in local government law with an emphasis on county governance and hopes to make an appointment by their March meeting.